and a parking lot packed with dinghies, trailers and sailors swapping parts, tools and advice. Indeed, the vibe all weekend long epitomized what small boat racing is all about: fierce but friendly competition on the water, and camaraderie ashore. More than two dozen Vipers lined up for their first class start on the East Course, soon to be followed by separate class starts for the F-18 catamarans and RSK6 sportboats. 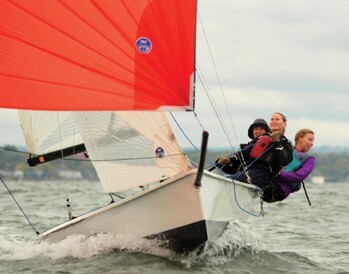 The South Course hosted separate starts for 5O5s, Fireballs and the free-for-all Portsmouth Division, which this year included WETA trimarans and Flying Dutchmen (International Canoes, also perennial Portsmouth competitors, were forced to withdraw after several were damaged in a traffic accident on the road to Rye). Following five grueling races, everyone was ready to call it a day and enjoy some Heineken hospitality ashore. One of the signature features of this event is a sumptuous buffet dinner, and this year was no different. Heineken 5-liter kegs (known to discerning aficionados as “bubbas”) graced the center of every table in the house and fueled many discussions about the day’s conditions, race tactics and results. During the dinner, regatta founder and Co-Chair John Wyles, assisted by his tireless wife Sally, raffled off some very nice gear provided by sponsors Ronstan and Annapolis Performance Sailing before the competitors returned to the parking lot to tweak their rigs and then retire for some much-needed rest. Many were treated to deluxe accommodations provided by several AYC families. The hospitality of AYC’s members is one of the main reasons the event is so popular, as one WETA sailor explained later. Beautiful engraved photo frames (thanks to sponsor TriBeach Holdings) went to both helm and crew who placed in the money, and first place teams also received more swag from Ronstan and some great toques from event sponsor Zhik; trophies and Zhik toques also went to the top female and top under-21 helm or crew. To see all the results, go to YachtScoring.com and click on “Select Event,” scroll down and click on “11th Annual American Yacht Club High Performance Dinghy Open sponsored by Heineken.” For more information, visit the regatta Facebook page at facebook.com/HeinekenHPDO, which has event photos courtesy of event sponsor PhotoBoat.com. 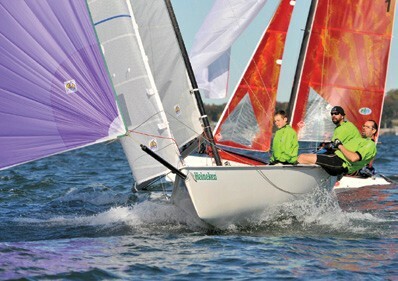 David Schwartz-Leeper is the Co-Chair of the American Yacht Club High Performance Dinghy Open sponsored by Heineken.